Isis Forestry - a well established and respected forestry and woodland management consultancy working across Central and Southern England. Graham has a deeply held interest and belief in forestry as commercially viable and environmentally sustainable natural resource management. Graham holds a first class honours degree in geography and a masters degree in forestry from Oxford. He is a Chartered Forester (Fellow), Chartered Environmentalist and a full member of the Chartered Institute of Ecology and Environmental Management. Following a brief stint in Sri Lanka, Graham has developed 25 years experience in British forest management, as both contractor and consultant. Roles have ranged from being self-employed and working for small contracting firms to positions with national forest management companies and land agents. In 1998, Graham co-founded what is now one of the country’s most well known forestry, arboricultural and ecological consultancies, where as managing director he was personally responsible for the ecology and arboricultural divisions of the business before leaving in 2010 to set up Isis Forestry. During this time, Graham has worked for leading private landowners, universities, PLCs and local and central government clients. During his career, Graham has held senior positions and office with both the Institute of Chartered Foresters and the Royal Forestry Society and currently sits on the Forestry Commission’s East Midlands Forestry and Woodland Advisory Committee, and is one of two Institute of Chartered Foresters representives on Forestry Commission England's Applicant's Focus Group. 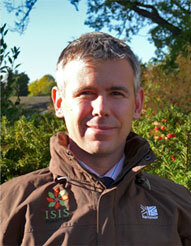 Nicky provides office based support to Isis Forestry from the Midlands office. Graham and Nicky have two children; Emily and Alex, and over recent years have both become members of the Welland Valley Triathlon Club, training regularly and competing in triathlons across the UK and Europe. Website designed by JHA Design for Isis Forestry. All rights reserved.